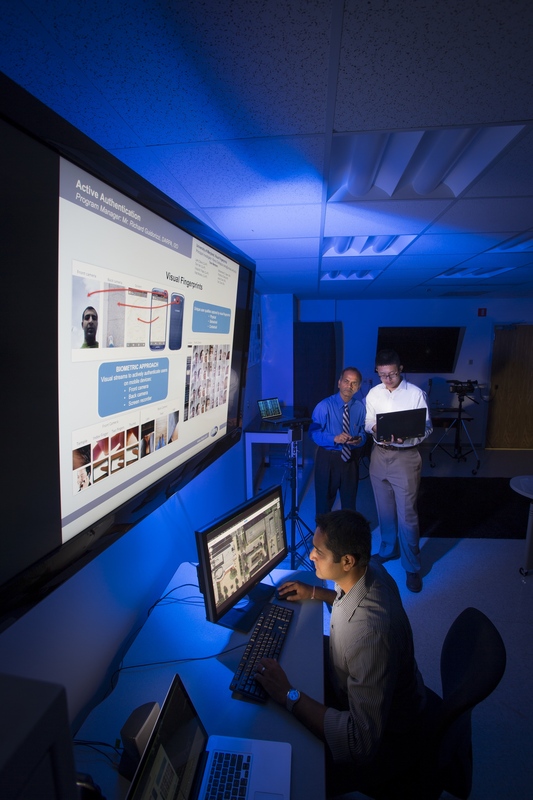 The Center for Automation Research (CfAR) at the University of Maryland is a leader in research and education involving computer vision, computer visualization, perceptual interfaces, and language and media processing. Launched in 1964 by noted computer scientist Azriel Rosenfeld, the center continues to advance groundbreaking discoveries in facial and gait recognition, spatial audio analysis, visualization of health care data, autonomy in robotics, document and media analysis, and more. the LANGUAGE AND MEDIA PROCESSING LABORATORY, where researchers are developing the latest tools and techniques to better access large heterogeneous databases of multimedia information objects. and the PERCEPTUAL INTERFACES AND REALITY LABORATORY, where experts use a combination of approaches—including computational physics, real-time computing, and psychophysics—to explore audio and computational acoustics and develop perceptual user interfaces for computers and other devices based on voice, sounds, gestures and touch. RAMA CHELLAPA (background, blue shirt) leads a research group working on active user authentication for mobile platforms such as smartphones. They are developing fusion algorithms for continuous authentication of the user based on screen fingerprints, touch signatures, and faces.